Best friends, Amy Lukas and Mary Catterlin, set out to sail the perimeter of Lake Michigan and document the experience aboard a handmade canoe. Lake Michigan has 1,638 miles of shoreline total. The trip traversed close to 1,200 of these miles. We planned to travel 10-25 miles everyday, be it sailing or paddling. And as it turns out, our daily miles ranged from 7-43 miles per day, when we were able to get on the water. It took us exactly 3 months/93 days to come full circle. Much of our progress depended on weather, waves, and delays on land. So with that in mind, we spent a quarter of a year camped on beaches, campgrounds, sleeping aboard boats, and in the homes of many new found friends. Our journey began in Beverly Shores, Indiana, the very south end of the lake. From there, we traveled westward towards the Illinois and Wisconsin border, from island to island off Door Peninsula, along Michigan's Upper Peninsula, and back down through Michigan’s coastal waters on the east side. We only packed the essential camping and boating supplies as well as some extra gear for documenting the trip to share our experience with you. Outfitted with GPS spot devices, phones, cameras, and journals, we documented the journey and posted progress updates here whenever possible. You can hear our complete story of traveling full circle on the lake we love most by reading our book or watching our documentary HERE. Originally from the UK, Rob is a high level British Canoe Union Coach/Leader Educator with 30 years of global paddling experience. Having circumnavigated the UK in a sea kayak, lead multiple extended expeditions within the Arctic Circle in canoes, white water kayaked in every continent (well not Antarctica) and completed white water first descents in the Himalayas, his paddling resume is a long list of life lessons. As an Elite Performance Coach, Rob owns the global performance development business called Tetrakey.com. This sees him bringing together years of personal experience teaching high-performance paddlers, academic learning, and a deep understanding of what can motivate people. he aims to allow those who want to perform at a higher level to truly reach excellence in their performance. Outside of this global corporate work, he is currently coaching South African International Sprint Kayakers towards Brazil 2016 and Japan 2020 Olympics. Rob’s passion for his client’s development is contagious, using a fine balance of extensive knowledge, fun, and a unique inductive delivery coaching framework all leads to excellence in long term learning retention. Ginni Callahan founded Sea Kayak Baja Mexico and Columbia River Kayaking. She travels to coach in such exotic places as Australia, New Zealand, Chile, Chicago, Vancouver Island, Michigan, and Wales. Ginni is a 5-star Sea Leader and Level 4 coach. She is also the North American importer of Flat Earth Kayak Sails. In 2012, she played hooky from it all and sailed across the Pacific Ocean. Miraculous it was that two sea kayaks fit on deck, with an inch on either side. But they did, and that’s how we set out to cross the world’s biggest ocean: two Romanys, “Mutiny” the dinghy, the Good Captain Henrick Lindström, a stuffed moose, a drunk koala, and me, all on the 36’ steel-hulled sailboat “Misty”. There were seabirds and sunsets, atolls and outriggers. There was me trying to tow 10 tons of steel through the doldrums by kayak. There were three sharks bumping the kayak in Fakarava Pass. There were the reef lobsters we never found, and the coconut crab we did. Daniel Fox is a paddler, photographer, story teller, etc. who strives to be one with nature. Learn from Daniel's narrative how nature can restore the human spirit. Explorer and storyteller, Fox believes in the power of nature to restore the human spirit. He uses his narrative to inspire the public to STOP . BREATHE . RELAX . LISTEN and reconnect with the natural world. Sometimes philosophical, sometimes poetic, his stories, his photos and his “Minute of Nature” video series seek to capture nature’s essence and the insights it offers. He is the founder of W.I.L.D., an initiative that raises funds to send under privileged youth to wilderness immersion camps. Julie Chick was born in Portland and graduated from Oregon State University with a B.S. in Graphic Design. After several years of corporate tradeshow design and coordination she made her way to Hawaii and back to the Oregon coast as the owner of the Nehalem Bay Outdoor Company of eight years. Julie loves to be on the water and has found Tillamook County to accommodate that need. Julie is married, has two little boys and is teaching them to appreciate the environment through swimming, surfing, and kayaking. Superior recreational opportunities exist in our five watersheds! Approximately 200 miles of navigable water exists for every paddling skill-level from novice to advanced whitewater. A group of local citizens, the Tillamook County Water Trail Committee, has a shared vision since 2004 of developing a water trail system throughout Tillamook County. The Tillamook County Water Trail, a National Recreation Trail (as of 2012) is connected through signs, guidebooks/maps and access points providing a scenic and educational experience for recreational users.TEP facilitates the water trail project for this community-driven effort. OOPS GENERAL MEETING - WEDNESDAY, MARCH 25, 2015 - SPECIAL SCREENING OF THE FILM "RETURN OF THE RIVER"
A FILM ABOUT THE LARGEST DAM REMOVAL PROJECT IN THE HISTORY OF THE UNITED STATES, AND THE EXTRAORDINARY EFFORT TO RESTORE AN ECO-SYSTEM AND SET A RIVER FREE. Reviewed by Liz Trojan and Mel Wishan and found to be of great interest and wonderful cinematography. First screened in 2014, locally at the Portland Film Festival. Travis has worked in river conservation since the 1990's and since 2000 has led WR. He serves as a riverkeeper, actually making regular patrols of the river from Eugene to Portland. He holds a B.A. in International studies from Portland State University and a Masters degree in Environmental Science from John Hopkins University. Our guest presenters are Jonathan Walpole and wife Kirti ... "back from our 1000 km canoe trip down the Hanbury River, from its headwaters in Campbell Lake in Northwest Territories, to the Thelon River, and then down the Thelon and across three huge lakes, to Baker Lake in Nunavut. It was a long, wild, extremely remote trip with a bit of everything you might want in a canoe adventure: streams, small and large rivers, rapids, waterfalls, portages, lining, lakes both small and enormous like the sea, sun, rain, storms, heat, cold, wind and calm, wildlife ... and a lot of bugs." Jeff Houck, PT, PhD, Director of Research, Program of Physical Therapy at George Fox University, will offer a presentation on "kayak smarter not harder: keeping your body happy". Curious about sea kayaking along Turkey’s Mediterranean Coast, in ancient Lycia? This past June I spent a week in Olympos and Kas, along Turkey’s Turquoise Coast, a paradise for adventure sports, including sea kayaking. Come and see for yourself what a beautiful, historic and remote part of Turkey Lycia is, a place where people go for blue cruises, paragliding, trekking, mountain biking, scuba diving, snorkeling, just plain laying about getting a tan, and, most importantly, what a great place it is to paddle a sea kayak in its clear, turquoise blue water. Veteran kayaker Steve Scherrer recently paddled a solo, 8-day, self-contained journey down the last 145 miles of the Columbia River on a Stand Up Paddleboard. This is the last leg of the Lewis and Clark trail and he happens to live right at the end! Come see some sights of his adventure on the “Mighty Columbia” and learn how multi-day trips are possible on a SUP. This slide presentation and talk by Nigel Foster is themed on his latest book, Encounters from a Kayak, which celebrates the magical experiences that surround sea kayaking. The stories in the book are about the animals, people, flotsam and jetsam and special places around the globe that grab his attention. His irrepressible curiosity drives him to tease out unexpected stories from behind his subjects. These nuggets from around the world are bound together by water and the centuries-old form of sea travel: kayaking. We depend on our boats to keep us safe and secure on the water. Moreover, they represent significant investment(s). What can you do to keep your boat in tip-top shape? What repairs can you easily affect yourself and when should you think about taking it in to the shop? What is a good safety kit to keep with you in your boat and how do you use all that stuff? Kayaking professional Michael Bowersox will explore all these issues and more. Bring your own repair kit if you like to discuss and debate essential gear. In the summer of 2011, Jonathan Walpole, Kirti Walpole and Jenny Johnson paddled a thousand miles down the west coast of Canada. Starting from Prince Rupert, British Columbia, they followed an exposed outer coast route down to Vancouver Island. From there they switched to the more protected, but still remote and spectacular, inside passage route. After six weeks of paddling 10 or more hours a day they finally ran out of water to paddle in Olympia, Washington. They skillfully timed their trip to coincide with one of the coldest and wettest early summers on record for the notoriously cold and wet British Columbia coast. In this talk and slide show, they will recount their epic struggle against perpetual wind, rain and tidal currents as they worked their way down the pristine, untouched wilderness coastline of the Great Bear Rainforest. Oh, and in case you were wondering, the Pilgrims are Kirti's and Jenny's kayaks. They are "Pilgrim Expedition" sea kayaks from Sea Kayaking UK (SKUK), designed by Nigel Dennis specifically for smaller paddlers. This was their first major expedition. Jonathan is an accomplished expedition paddler and coach. A few of his notable accomplishments include a solo journey down the Outside Passage, a circumnavigation of the Lofoten Islands in Arctic Norway, including a passage through the Maelstrom (the world's largest tidal race), and a crossing of the Strait of Gibraltar from Europe to Africa. He is a BCU 5 star sea leader and a level 4 sea coach and assessor. He has been an invited coach at several International sea kayaking symposiums in North America and Europe, and is one of an elite group of paddlers sponsored by NDK (now SKUK). Besides sea kayaking Jonathan enjoys paddling canoes, rowing rafts, cross country skiing, and cycling. He has completed numerous long open canoe expeditions and is part way through a challenge to pole a canoe UP the entire John Day River - the third longest undammed river in the lower 48 states. Last summer he spent 50 days rowing a raft on some of the premiere whitewater in the west, including a 320 mile continuous journey down the Middle Fork, Main and Lower Salmon Gorges, into Hells Canyon of the Snake. In his spare time he is a Professor of Computer Science at PSU. Kirti did all that too! She is an accomplished sea kayaker in her own right. She holds the BCU 4 star award, and has successfully completed three BCU 5 star trainings. She recently retired from a 30 year career in high tech so she can dedicate some serious time to her outdoor pursuits. On Sunday Jonathan and Kirti leave for their next adventure - a quick 450km ski across Finland, from Russia to Sweden, along the Arctic Circle (that's cross country skiing ... quite literally). Jenny has an extensive background in whitewater. She is a regular winner of canoe slalom races and has paddled an open canoe down the Grand Canyon of the Colorado. With over a thousand days on rivers already under her belt she has completed most of the premier whitewater journeys in the west, multiple times. She started sea kayaking in 2008, and (with intensive coaching from Jonathan) rapidly developed into a skilled and accomplished sea kayaker. In her first major sea expedition she paddled 350 miles down the west coast of Vancouver Island. She is currently working toward her BCU 4 star leadership award. Jason Self, A Ling Cod's worst Nightmare. Though we often forget it, or perhaps are not even aware of it, all kayak's we paddle are descended from boats used as platforms for hunting. Rather it was stalking seals, polar bear or even walruses, a kayak's purpose was to bring in the nutrients and resources to sustain life of hunting people. Though we no longer depend on Kayaks for food, we can reconnect with the source through using our kayaks for fishing and crabbing. Come to the October general meeting to learn about the pleasant art of kayak fishing from one of the sport's leaders, Jason Self. We all have our favorite places to paddle. We are fortunate with so many great trips so close to home. What we sometimes forgot, however, is that just beyond our back yard on the coast is world class paddling. 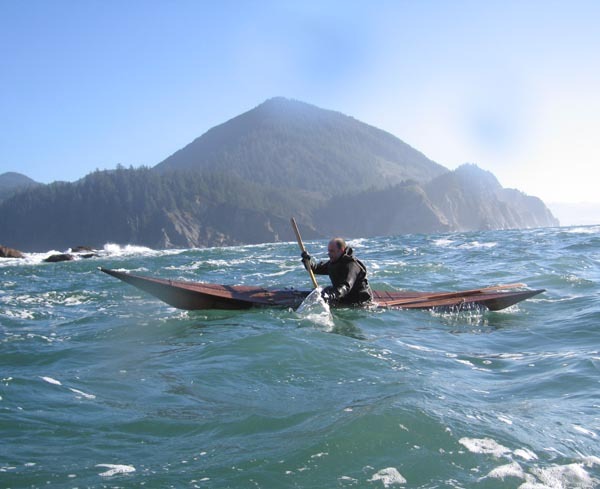 In this presentation, we will explore a few of the classic paddling trips along the Washington and Oregon coasts; Hobuck Beach, Tatoosh Island and Neah Bay at Cape Flattery on the northwest corner of Washington; LaPush (a little further south), and several locations from Cascade Head to Port Orford and Gold Beach in Oregon. These are coastal excursions with potentially rough water, but on many summer days, there are plenty of opportunities for calm water as well. In addition to beautiful pictures (think whale sightings and sea caves), the talk will include logistics, launch sites, and just a bit about the skills you need to explore the Washington and Oregon coasts. This month, we will have an evening of awe and wonder with Bob Weinman. Bob, together with his wife Evelyn, are the founders of Beachwalk Project, a national, clean water awareness project which is traveling the major coastlines of the United States by foot and kayak. The team is working to raise awareness for the protection of everyone's right to clean water. Travelling is a bit of an understatement has Bob has logged thousands of miles paddling the entire Eastern Seaboard and circumnavigating Guam, Evelyn's native land. They have also set plans to paddle the Gulf Coast and recreate Bob's favorite book Paddle to the Sea by paddling the Great Lakes. Along the way, Bob and groups of like-minded volunteers educate community and national groups on issues of clean water and community involvement. Please join your compatriots Wednesday, August 29th, 6:00 PM for an evening of fellowship and learning with Reginald "Reg" Lake. Reg is one of the fathers of modern sea and white water kayaking as well as an award winning sea kayak designer. Reginald "Reg" Lake is one of the founding fathers of modern kayaking. Reg started kayaking in 1970 and progressed through both white water and sea kayaking. He, along with contemporaries Doug Tompkins, Yvon Chouinard and Royal Robins, had numerous first descents. He has kayaked many destinations around the world, including Ecuador, Costa Rica, Pakistan, and especially Chilean Patagonia, Tierra del Fuego, and the like. He is still actively kayaking at the ripe age of 68 and has in fact just returned from another Patagonian expedition. Aside from his kayaking adventures, he is contributing to performance boat design working closely with the Sterling Donalson. The award winning Sterling Reflection is based on Reg's design concepts. Now, he is hard at work on a smaller performance sea-kayak model, the Progression, to be released by Sterling Kayaks soon. Our guest for the evening will be Harvey Golden, perhaps the world's foremost experts on traditional kayaks and baidarkas of the world's polar regions. As of 2011, Harvey has surveyed over 200 kayaks—some 400 years old, and others being sub-types or historically significant kayaks never studied before. Books on Alaskan kayaks and Canadian kayaks are presently in the works. Golden lives and builds in S.E. Portland, and has just opened up the Lincoln Street Kayak & Canoe Museum featuring replica kayaks and canoes as well as models and original craft. Come to this meeting to meet Harvey, find out about traditional kayaks and learn more about the roots of our sport.